Orthodontic technology is consistently improving and evolving – doctors are dedicated to finding constant, new ways to ease your orthodontic treatment and shorten treatment time. Patients used to wear braces for over 3 years! Appliances and overall treatment are now lighter, less conspicuous, and more precise than ever before. We know you want to show off your new smile as soon as possible, so even though treatment times are shorter than ever before, we offer a few different ways that you may be able to speed up your treatment! If your case allows for it, Dr. Hickory may suggest that you are eligible for accelerated treatment. AcceleDent is an at-home treatment that, when used in conjunction with orthodontic appliances, speeds up your treatment time. AcceleDent is a handheld device that has a mouthpiece, which goes directly into your mouth and around your teeth. You turn the device on and through small vibrations; it stimulates blood flow to your gums and therefore helps your bones integrate with your teeth’s new positions. 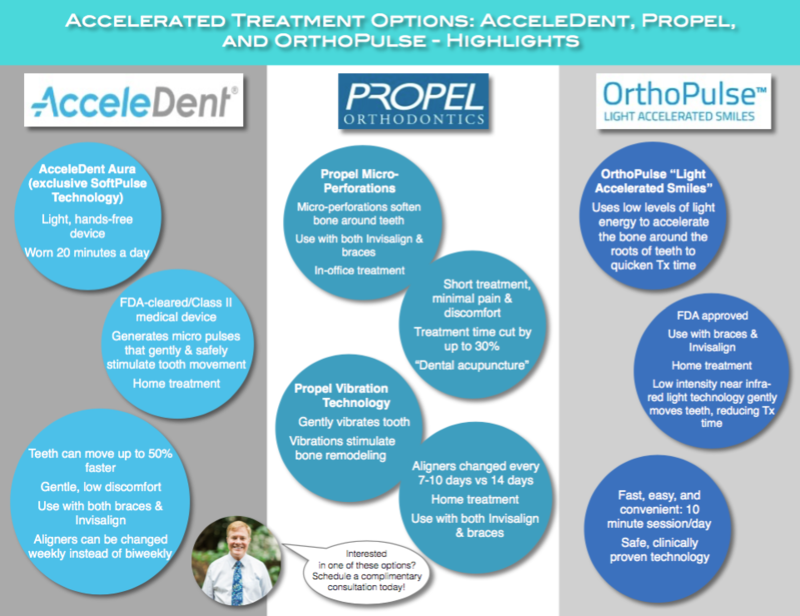 AcceleDent is compatible with both Invisalign and traditional braces. To ensure best results, AcceleDent should be used everyday for 20 minutes. We like to suggest doing it when you are watching TV or reading since it is so easy! Studies have shown that this device can shorten your treatment time by 38-50 percent! The Propel micro-perforated system utilizes bone biology to make the bones in your teeth more supple, allowing your teeth to move to their ideal positions quicker. Teeth are attached to the bones in your jaw, and these bones are fairly rigid, or “stuck” in their positions. By softening the bone and stimulating bone growth, Propel increases blood flow so that your jaws will retain their strength as your teeth are moving in your mouth. Propel is an in-office procedure that Dr. Hickory performs, and involves putting small holes, or “micro-perforations” in strategic areas of the gum line. Patients experience little to no discomfort, and the entire procedure takes just a few minutes! Propel can be used on any type of orthodontic treatment. Propel gentle vibration technology gently and safely vibrates problematic teeth. These vibrations stimulate bone remodeling. This vibration technology has been proven countless times by clinical research and studies to move teeth to their ideal positions quicker. Propel’s vibration technology is compatible with both traditional braces and aligners (Invisalign). When combined with Invisalign, the little vibrations actually make your aligners fit your teeth much better than without. Therefore, your Invisalign aligners can be changed more often – every 7 to 10 days rather than every 14 days. Clinical studies have shown that Propel can shorten your treatment time by 50 percent or more. Most patients are eligible for Propel, but it works especially well for adult patients whose jaws have stopped developing. OrthoPulse uses very small levels of near infrared light to accelerate your orthodontic treatment time. It stimulates the surrounding bone of the teeth to boost bone movement and shorten overall treatment time. This at-home, convenient system needs to be used just 10 minutes a day, and can be done before bed, while watching a movie, or just relaxing! This type of technology has been used in other health and medicine fields for over 60 years, and is safe, and proven by research to be effective. It can be used with both braces and Invisalign, just like other accelerated treatment options! Click on the image above to expand and see highlights! I’m interested in accelerating my treatment time–what now? Contact us for a complimentary consultation, or, if you are already a current patient, call us and we can see if accelerated orthodontics is an option for you!